Anyone who believed that un-emptied waste baskets, rats, roaches and other vermin in public schools across the city were going to interfere with the Chicago Board of Eduction's plans to continue funneling public money to Aramark corporation might be called delusional. 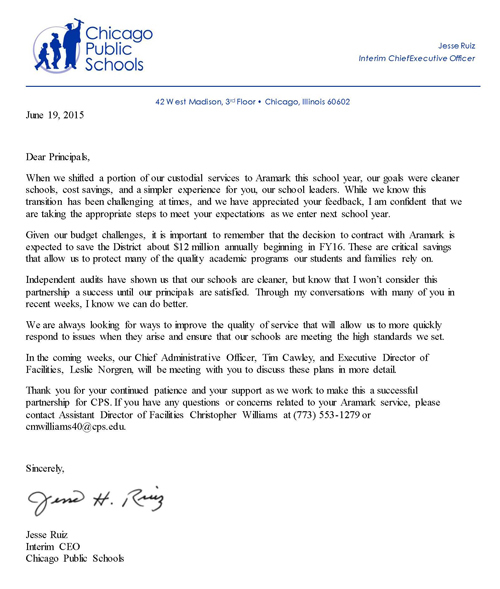 The June 19, 2015 letter from Jesse Ruiz to CPS principals.Once the members of the Board of Education voted unanimously to provide hundreds of millions of dollars to Aramark corporation over the next decades for school custodial services, the Board also guaranteed that it would be able to use its "data" to prove that the claims upon which the contracts were based were absolutely, positively and completely TRUE. And so, on June 19, 2015, CPS principals were not surprised to receive a letter from Jesse Ruiz, who is still the Board's "Interim CEO", assuring them that (a) things were cleaner and (b) money was being saved. "When we shifted a portion of our custodial services to Aramark this school year, our goals were cleaner schools, cost savings, and a simpler experience for you, our school leaders. While we know this transition has been challenging at times, and we have appreciated your feedback, I am confident that we are taking the appropriate steps to meet your expectations as we enter next school year. "Given our budget challenges, it is important to remember that the decision to contract with Aramark is expected to save the District about $12 million annually beginning in FY16. These are critical savings that allow us to protect many of the quality academic programs our students and families rely on. "Independent audits have shown us that our schools are cleaner, but know that I won�t consider this partnership a success until our principals are satisfied. Through my conversations with many of you in recent weeks, I know we can do better. "We are always looking for ways to improve the quality of service that will allow us to more quickly respond to issues when they arise and ensure that our schools are meeting the high standards we set. "In the coming weeks, our Chief Administrative Officer, Tim Cawley, and Executive Director of Facilities, Leslie Norgren, will be meeting with you to discuss these plans in more detail. "Thank you for your continued patience and your support as we work to make this a successful partnership for CPS. If you have any questions or concerns related to your Aramark service, please contact Assistant Director of Facilities Christopher Williams at (773) 553-1279..."